Though the event takes place indoor, the dresscode is outdoor, as it may be cold inside! Satellietgroep & all invited artists and designers and guests warmly invite you to join the exhibition & program to rethink our perceptions of culture and nature. During five weeks, every week we shift the focus within the whole exhibition process, with a program of workshops, artist talks, seminars and expeditions. Visitors have the opportunity to connect and contribute to the ongoing process of artistic research, share their thoughts and insights, and discover through the arts a multitude of fields of knowledge. 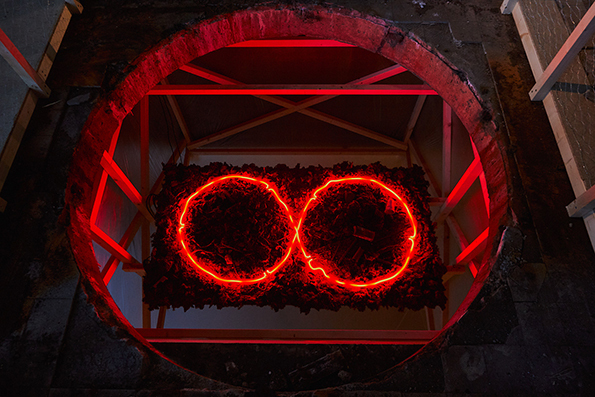 Last chance to visit Climate as Artifact - Klimaat als mensenwerk! This weeks special program features guided tours on Thursday and Friday at 15:00, 17:00 and 19:00. On Saturday November 17 Time-depth of Landscape with a special geology-archaeology consultation with Masha Ru and geologist/volunteer archaeologist Bert van der Valk (Deltares), followed by the artist talk by Giuseppe Licari. On Sunday Nov 18 we celebrate the Finissage with as special Zeelab#5: Workshop Landscape Observations by Tiemen Cocquyt (Museum Boerhaave) & artist Irene Kopelman & the artists and designers of Climate as Artifact. SPECIAL: SHARE YOUR ESTIMATED GUESS! 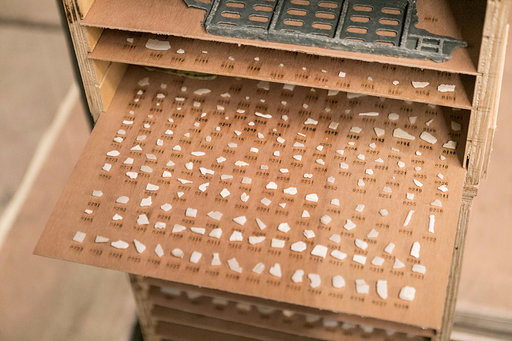 During 5 weeks, artist Sachi Miyachi counted the bricks of the Electriciteitsfabriek. Can you guess how many bricks she counted? Mail climate.as.artifact@gmail.com with your estimated guess! On Sunday November 18 at the Finnisage at 17:00 Sachi will reward the one with the nearest estimate of counted bricks with a special artist gift! Photo: Johan Nieuwenhuize. Free guided tours in Dutch and/or English this week on Thursday and on Friday at 15:00, 17:00 and 19:00. 14:00-15:15 Geology-archaeology consultation with Masha Ru and special guest geologist/volunteer archeologist Bert van der Valk (Deltares), so bring your samples of earth, sands, stones etc. if you want to learn more! 15.45-16:00 Artist talk by Giuseppe Licari. Bert van der Valk (1952) studied quartary geology and lowland genesis at the Vrije Universiteit in Amsterdam and graduated in 1992 on a research project on the Dutch coast. Since 1999 he has been working at Deltares as a senior advisor geologist, on projects at home and abroad, often as a team leader. 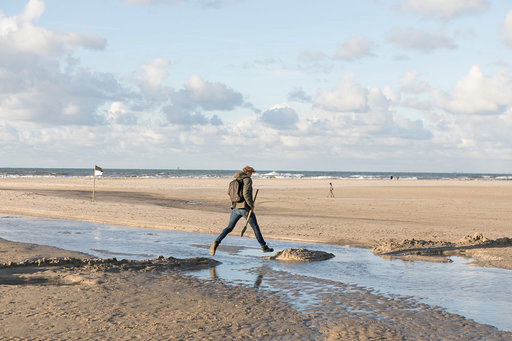 Van der Valk has a special interest in long-term coastal development, especially in relation to geological processes of sandy sedimentary systems, including the dunes. Examining and publishing about the archeology of Western Netherlands is part of his leisure activities, in close relation to his professional activities in the field of long-term coastal formation. Free admission on Nov 18! 17:00 Outcome of the estimated guess of the amount of bricks Sachi Miyachi counted at Electriciteitsfabriek. 18:00 Close of the exhibition. In this workshop, Cocquyt and Kopelman sketch how their respective work has led to a better understanding of optical instruments for observation. Cocquyt leads the audience through the history of science, and elaborates on the period in which optical instrumentation entered the methodologies for knowledge production. Kopelman takes this message further by sharing her work on the ‘graphic telescope’, a rare instrument that answered to two of the draughtsman’s basic needs for in situ drawing: the ability to trace the outline of forms (comparable to the function of a camera lucida) and that of bringing far away landscape vistas closer to the eye (telescope function). After the presentations, replicas of optical instruments will be made available for usage, so the sketched developments can be experienced in real life, and as a source for triggering discussion. This program is part of the series Zeelabs that Satellietgroep organizes in the context of Feest aan Zee 2018. Each Zeelab is a meeting of artists and designers with scientists and public about culture and nature, coast and climate. Climate as Artifact - Klimaat als mensenwerk is an exhibition / program / festival / collective / a work in progress... and a dialogue space offered by art. In the middle of the exhibition we invite you to join the ongoing dialogue of arts, science and society. During the past 12 years, artists collective Satellietgroep has developed a working method called EXPLORE, COLLECT, SHARE & LEARN. For Climate as Artifact, the Exploring phase started with inviting 17 artists and designers to share their fascinations for time and space. Following these fascinations, new works evolved and the network of engaged scientists and audience grew during the Collecting phase. On October 18 we opened the exhibition and started the Sharing phase, with a public program of expeditions, seminars, guided tours and more. We proudly invite you to the Learning phase. During the Finissage on November 18 we warmly invite you to join the Workshop Landscape Observations! 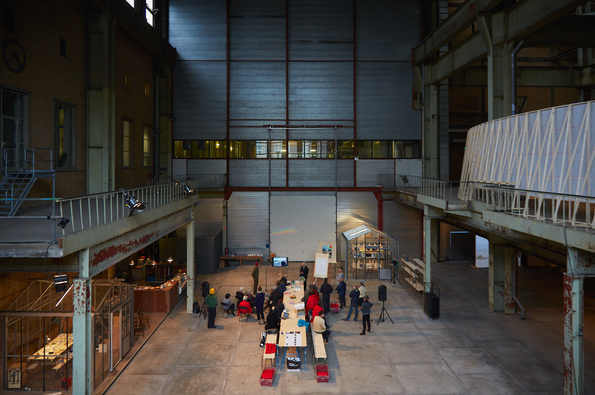 With special thanks to the team and volunteers of Electriciteitsfabriek, the co-builders, our valued co-writer Tess de Ruiter, photographers Johan van Nieuwenhuize and Florian Braakman and delicious catering by Yoshi Oyamada. Made possible with the support of Mondriaan Fonds, BankGiro Loterij Fonds, Stimuleringsfonds Creatieve Industrie, Gemeente Den Haag, Feest aan Zee and Fonds 1818. Opening intervention with the Dutch premiere of Sun Following Prism on October 18, with special thanks to landscape architect Dirk Sijmons, art curator and critic Valentijn Byvanck (Marres), cultural sociologist Ruben Jacobs & all artists and designers. Photo Johan Nieuwehuize. A special workshop themed around the question What role does fieldwork play in environmental literacy for humans and artificial intelligences? Theun also presented the Fieldguide to Random Forests publication that collects observations, images, tools and questions that emerged from various fieldwork sessions. With special thanks to Sjef van Gaalen, Sander Turnhout, Jan de Graaf, Jeroen van Westen, Marinus van Dijke, Semuel Sahureka, Michelle Geraerts, Anne van Leeuwen, Marjolijn Boterenbrood, Harpo ’t Hart, Joyce Heckman, Maryan Klomp, Cocky Eek, Maria Verstappen, Alce Smit, Jari Schulp, Rembrandt Zegers, Leo van der Vlist, Frank Heckman, Marit Mihklepp and guests. Photo Johan Nieuwenhuize. Zeelab#4: Seminar Global Currents, themed around the question How to (re)gain placement within nature? With Nishiko, Esther Kokmeijer, Aliki van der Kruijs and Jos Klarenbeek and special guests oceanographer Gerbrant van Vledder, filmmaker Marleen van der Werf en curator Roel Arkesteijn (Stroom, De Domijnen) on October 28. Read more. Nishiko works all days In Situ during Climate as Artifact in her special workspace. Shortly after the earthquake and tsunami disaster in Japan in 2011, Nishiko began her Repairing Earthquake Project. She collects damaged, often personal items in the disaster area and starts a long process of repair, guided by chance encounters and dialogue, trying to find foster parents for the objects. On November 17 her solo exhibition at Stroom The Hague opens. 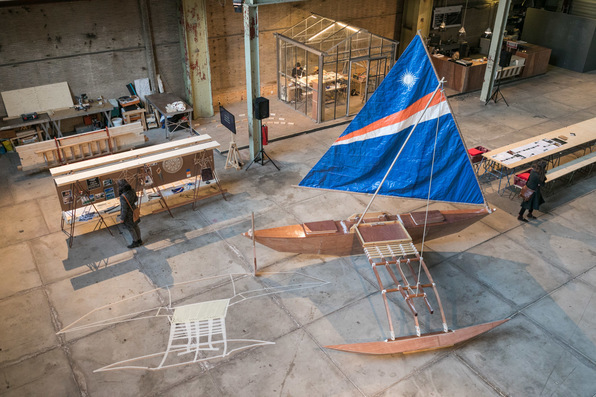 Together with special guests Isockor Anwell (canoe builder from the Marshall Islands) and Henrik Richter-Alten (GIZ, sustainable sea transport) Esther build on site in 2 weeks a traditional out-rigger canoe to share & learn more about sensing the waves. Special thanks to oceanographer Gerbrant van Vledder, Alson Kelen and Tamie Bowman from WAM Marsall Islands, anthropologist Joseph Genz and physicist John Huth, including all who attended the celebration of the Ritual for baptism of the outrigger canoe. Photo Florian Braakman. 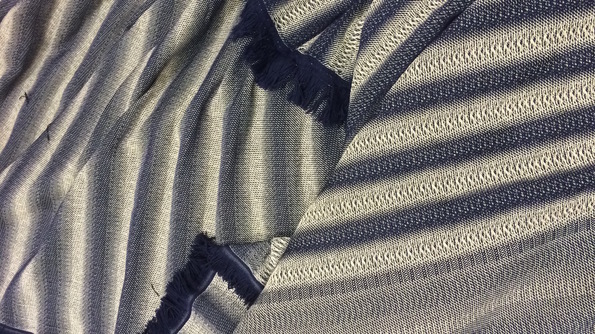 Kadans grows into a rich collection of textiles, displaying the time-sensitive variety of patterns that are created by waves. Based on the raw data collected by buoys and platforms offshore the coast of the Netherlands, Kadans develops into a tactile sea-archive. With special thanks to Gerbrant van Vledder, Marion Tissier and Sierd de Vries (TU Delft), RNDR, Marian Stubenitsky, Lanificio Leo, Sander Manse, Rik Komaromi and Elvis Wesley. Photo: Aliki van der Kruijs. Three subjective guided tours 'Excarvating the Square Mountain' by Sachi Miyachi, Thijs Ebbe Fokkens and Maurice Bogaert on November 3. Workshop 'East-West-Thinking Cement' by Onkruidenier icw Rosanne van Wijk and guests on November 4. Sachi works all days In Situ during Climate as Artifact. 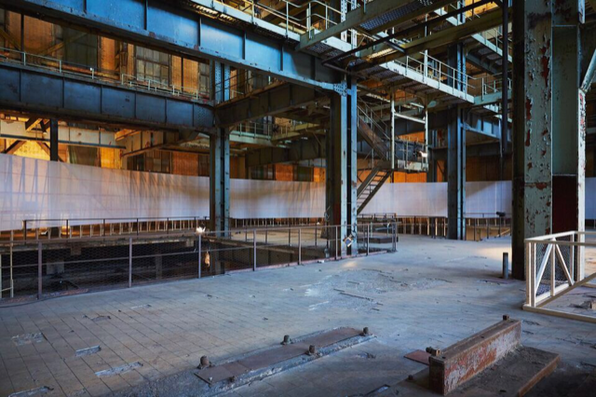 She explores the Electriciteitsfabriek on a conceptual level by engaging with the physical structure of the building. Although the building is known for its industrial features, the raw materials that were used in building the Electriciteitsfabriek are essentially all derived from nature. Can you guess the amount of bricks Sachi counted at Electriciteitsfabriek? According to Thijs, art promises to offer the means to speculate on things to come, to place oneself in another time, another space and at another pace. But, how can you relate to the rapidly changing imaging of the future? 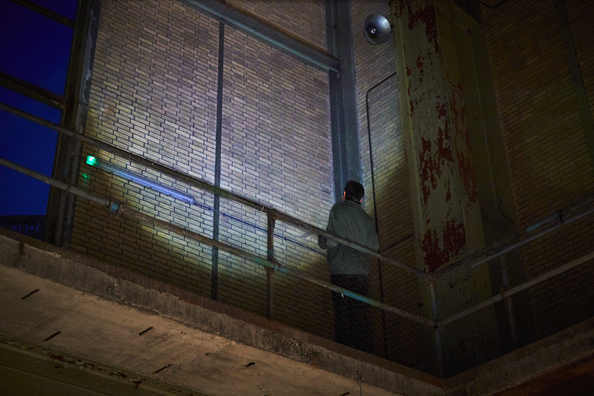 Thijs places his work in an intermediate layer; it is not located on the ground floor or on the first floor, but literally in an opening in between. With special thanks to Booms construction advise. Photo: Johan Nieuwenhuize. Maurice build his biggest work ever! 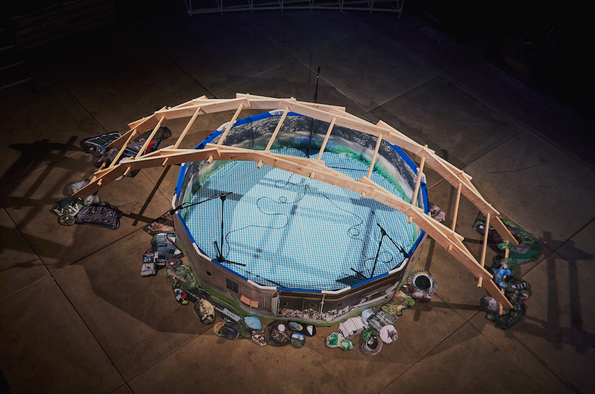 The installation draws the largest possible circle in space. Crosses the space and escapes obstacles along the way, such as the steel columns of the factory. In art history, a panorama was a way to imitate or simulate a landscape. The experience of a landscape or so called nature is not unambiguous, but subject to the spirit of the time. This installation is white, and thus escapes the romantic illusion of projecting an idea of a landscape. The visitor enters, as it were, into an undefined film set. Photo: Johan Nieuwenhuize. With the ongoing research called East-West-Thinking Cement, Onkruidenier & Rosanne van Wijk connect Climate as Artifact in The Hague with the parallel artist-in-residency at Bamboo Curtain Studio in Taipei, on the island of Taiwan in the East China Sea. On both locations they bring together the ingredients - sand, burnt shells, sugar and glutinous rice - to fabricate cement according to a historic recipe brought by the Dutch from ancient China and introduced at Formosa during colonial times (1624-1662). With special thanks to Jo Lene On, curator of De Appel, artists Chaotze and Jungsheng and the parents of Ronald. Photo: Florian Braakman. 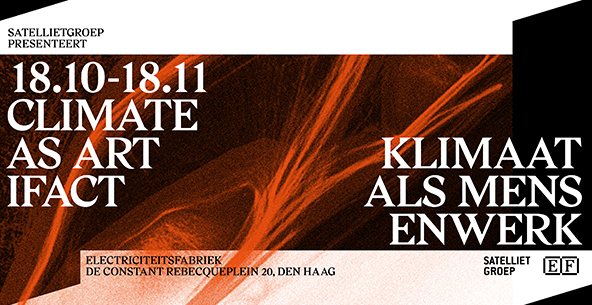 Double premiere with Maurice Meewisse and Lotte Geeven on November 8. Seminar art-science-society 'Voice of a Sinking Landscape' with Josje Hattink and guests on November 10. 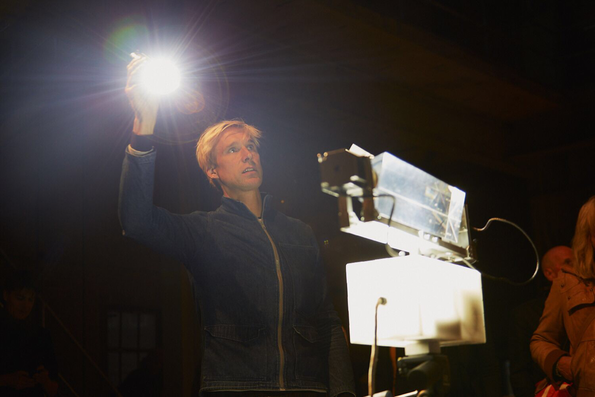 During Climate as Artifact Maurice returned eight times to the Zandmotor to make his second stop-motion film titled Eight Working Hours, to complete his triptych Eighteen Coffee Breaks – Eight Working Hours, composed of two stop-motion films and a sound piece made by Jordy Walker. Eight Working hours premiered on November 8. With special thanks to the people who joined Maurice in the making of this work. Photo: Florian Braakman. End of September 2018, Lotte traveled to the Sahara for Climate as Artifact, in search of acoustic sand. Sand that sings, whistles, whines and roars. This extremely rare phenomenon, that is caused by a certain type of sand that sounds like an orchestra when the wind sets it in motion. SCORE premiered on November 8. Made in collaboration with composer Thom Driver (UK), graphic designer Studio Dongyoung Lee, edit advise by Eric Feijten and camera Lotte Geeven. Special thanks to Tissardmine crew & friends, Hilversum City Orchestra, Victor Wennekes, Nathan van Ewijk, Terpstra Muziek, Hampe & Berkel. 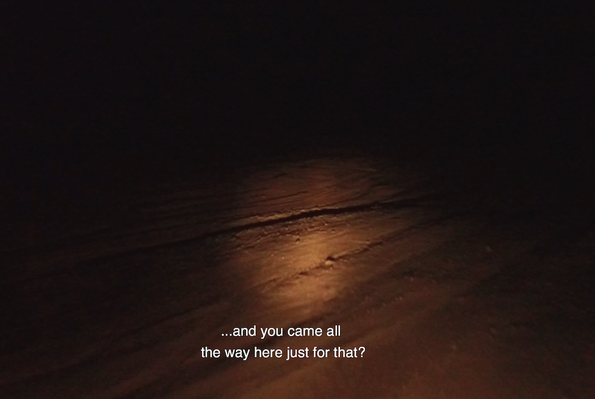 Image: film still by Lotte Geeven. Voice of a Sinking Landscape by Josje speaks about the sinking landscape of the Horstermeer polder. Literally digging away the soil underneath your feet, to create new land to live on; peatlands, polders, dunes, dikes. Josje engaged in a long term dialogue with climate scientist Tanya Lippmann, documented in the Zine. With special thanks to drs. Tanya Lippmann, dr. J van Huissteden, Jan Zwagerman en Klaske Andela, Jan Siteur, Henk Stuyver (President), the people of Horstermeerpolder, Cynthia Bruining, Jan Wilshaus, Tineke Gebbeken, Historische Kring Nederhorst ten Berg, Waterschap AGV, Natuurmonumenten, Joost Koskamp and Matthias König. Special thanks to dr. Freek Busschers, Pieter van der Klugt and Sieb de Vries (TNO, Deltares) for sharing VC17. 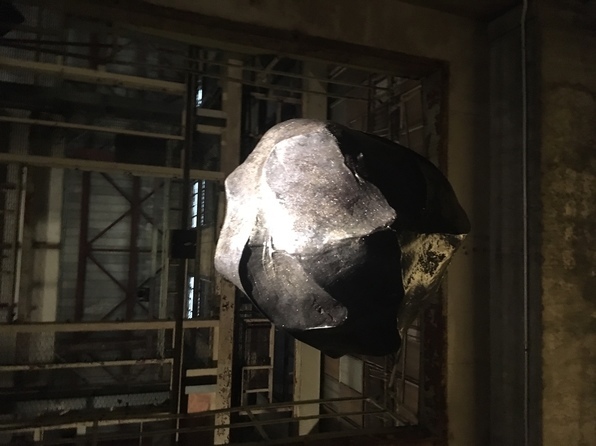 Geology-archaeology consultation with Masha Ru and special guest geologist/volunteer archeologist Bert van der Valk (Deltares), followed by artist talk by Giuseppe Licari on November 17. Giuseppe made Disco Stone of epoxy. The material of our century, which looks like glass, but is artificial, like the steel waste and quite toxic. The work reflects as a metaphor our planet and our greed for resources. Learn more at his artist talk on November 17. 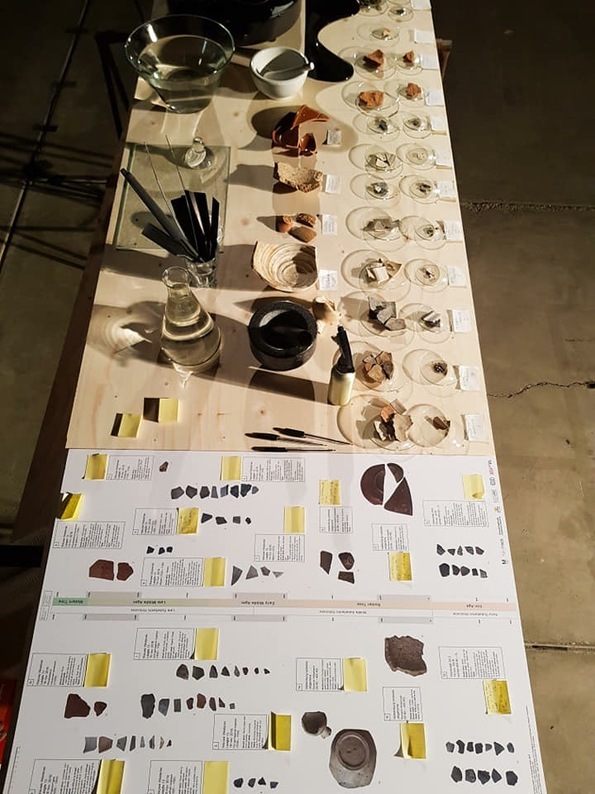 Masha focuses on exploring the possibility of engagement with local clay and archaeological ceramics artifacts from the area of The Hague, with local experts. Dialogue forms the core of this research. 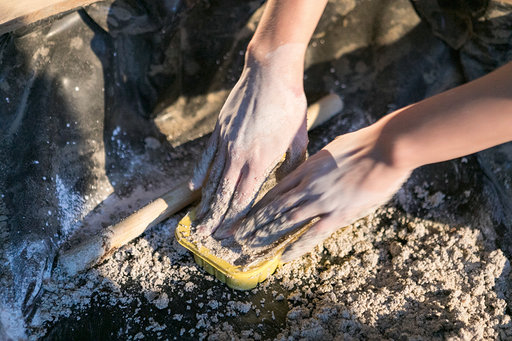 During tastings and the special performance Discourse with Clay, she investigates how people react to physical contact with different types of clay and artifacts. With special thanks to Bert van der Valk, AWN (vereniging voor Vrijwilligers in de Archeologie Den Haag en Omstreken), Fazle Shairmahomed, Marit Mihklepp, Jester van Schuylenburch, Alain Chaney, Joris-Jan Bos of 3TREESceramics and all vistors who joined the tastngs and shared their experiences. Photo: Masha Ru. Finissage: Zeelab#5 Workshop Landscape Observations by special guests Tiemen Cocquyt (Rijksmuseum Museum Boerhaave) & artist Irene Kopelman & the artists and designers of Climate as Artifact on November 18. At 17:00: outcome of the estimated guess of the amount of bricks Sachi Miyachi counted at Electriciteitsfabriek. € 5,- for students, CJP, Ooievaarspas and 65+ p.p. € 7,- Day Ticket p.p. Jacqueline Heerema, Francois Lombarts & Lotte Bosman. With special thanks to Mondriaan Fonds, BankGiro Loterij Fonds, Stimuleringsfonds Creatieve Industrie, Gemeente Den Haag, Feest aan Zee and Fonds 1818. Long term projects are 'Badgast' - artist in residency program at The Hague/Scheveningen (2009 - 2014), 'Now Wakes The Sea', the international exchange residency program in collaboration with international cultural partners (since 2012). Since 2014 Satellietgroep develops the first artistic research on the Zandmotor, the newest innovation on coastal protection, called Building with Nature. In these programs artist in residencies are used as a research method to enable artists, designers, students and scientists to do fieldwork and to work on site with local partners, coastal communities and experts in order to map out and research the current status of coastal transitions and to generate new narratives and perspectives. The programs function as an alternative source for collecting. New concepts and works are developed that we connect and contextualize with reference works for public events like expeditions, exhibitions, workshops and presentations at expert conferences, often outside the artistic domain. Artist in residents are invited to critically explore and visualize the zones of coexistence of man and water and reveal different perspectives. By interconnecting coastal communities, arts and science we share local knowledge on global level to gain sustainable insights on coastal transitions that transcend local and national issues.